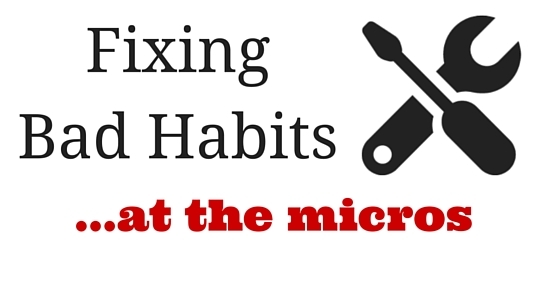 Bad habits are one of the biggest problems that hold people back in micro stakes cash games. Nobody starts out as a perfect poker player. In fact such a thing doesn't exist even among world class pros. My education in poker was (and still is) largely about making adjustments from the bad habits that I had either developed naturally or that I learned from somewhere else. In this article I am going to discuss some of the worst bad habits that I had when I was starting out in poker and how I went about fixing them. The first thing that I want to mention before I get started is that I think most people broadly fit into one of two categories when they start playing poker. In one corner we have the Nits. These are people who naturally play really tight, will only bet with the nuts, will rarely bluff and need 180 buyins before moving up to the next limit. Playing it safe is the key for them. On the other hand we have the LAGs as I will call them. These are people who are naturally very loose, love to bluff and have absolutely zero regard for bankroll management. These people are action junkies and they love to gamble! A recent podcast interview with the tournament poker phenom Dan Colman perhaps best illustrates the LAG approach. This guy cut his teeth in poker at the very highest limits and has crazy amounts of gamble in him. And I would have to actually nominate myself as one of the best examples of a Nit given my well known crazy amount of play (and winnings) at the very lowest stakes online. Most people fall somewhere between these two extremes. However, the reason for this discussion is to point out that Nits and LAGs will naturally develop different bad habits. Since I was (and still am) a Nit for life, I will be discussing bad habits mostly from the Nit perspective in this article. So obviously the first problem that all natural Nits like me are going to suffer from is playing too tight. I was a terrible Nit when I first started out. I would only play if I had a big ace, good broadway or a pair. In other words I was a preflop folding machine. Now this approach can still be profitable in today's games but only at the very lowest limit (NL2). However even then, your winrate will be small and you will be giving up a ton of EV. If you currently play way too tight like I did in the beginning, the answer is not to start raising every suited connector and 3Betting J9 in your next session. It has to be a gradual progression to playing more hands. The first thing that you should focus on is playing more hands when you are in position. This will make it far easier for you to get used to playing lower strength hands. It will also make it much easier for you to turn a profit since all the money gravitates towards the button in poker. Secondly, as I mentioned above, it is much better to gradually open up your game. So if you currently only open A9 or better for instance from late position, just try adding A8 next time. When you get comfortable with that, add A7 and so on. In time you can start to open up a bit from other positions as well but it should not be by too much. As I mention in both of my books I think you should be playing at least 3 times as many hands from late position as from early position. And you should be relatively tight from the blinds as well. And this isn't just the Nit in me suggesting this. I say this because this is the way that the game works. If you look in your Pokertracker or HEM database and check your winnings by position, then you will see exactly what I mean. As you move up the stakes to NL25 and higher you will want to start balancing your range more from all positions. But at NL10 and below where most of your opponents are paying no attention to this, I would just abuse the hell out of the most profitable seats (LP for sure and MP to a lesser extent) and stay reasonably tight in the less profitable ones (EP and the blinds). It took me the longest time just to get used to stealing the blinds with anything that wasn't a broadway, pair or a premium hand! CBetting as a bluff? Double barreling? These concepts were crazy to me when I first started out as well. But in today's games if you don't get used to betting from time to time when you don't have much of anything, then your winrate will suffer in a big way. And I am not talking about running triple barrel bluffs with 5 high here. This is still largely suicide in a lot of small stakes cash games given the amount of bad players who will call you down light. What I am talking about is stealing the blinds with 30-40% of hands, CBetting the flop 60-70% of the time and double barreling 50% of the time. These are rough numbers that require adjustments as you move up but I think you get the idea. You need to be betting a fair bit when you don't have much of anything. Now of course it is still smart to have some equity. If it is folded to you on the button and you have 83o, you should definitely just fold unless both of the blinds are epic scale Nits. And likewise postflop, you don't want to be blindly barreling no pair/no draw hands into the many calling stations at these limits. You should have some equity, a favorable board texture, and most importantly, an opponent who will fold! I talked about how to find these types of players and exploit them in a recent article that I wrote for PokerNews.com. The bottom line is that you can't be afraid to bluff a little bit at the micros. This is something that becomes increasingly important as you move up to mid and high stakes. It is also a gradual progression much like playing more hands. Focus on the player type first and foremost and ask yourself if you can get this player to fold by stealing the blinds a bit wider or CBetting or double barreling with a bit higher frequency. After you start to understand the situations and players who can be moved off of their hands then it will all become second nature. In fact, it won't even seem like "bluffing" anymore. Can't Fold a "Good Hand"
This bad habit probably applies to both Nits and LAGs. And so many people at the lower limits (including myself before I fixed it) suffer from it greatly as well. This is the idea that you can't fold a good hand like top pair. Or you have to make that "crying call" because you have an over-pair. As I have stated before, I do not believe that there is any such thing as a crying call in poker, just bad calls. I talk about the lines that people take all the time on this blog and elsewhere. And these typically tell the story at the micros. Most players at these stakes are simply not capable for instance of calling you preflop, flatting your CBet and then raising your double barrel without the nuts. This line is literally them screaming at you with a bullhorn that they have at least a two pair hand. Therefore, you can fold your AA and say thanks to them for saving you money. Or you can call down, let them show you the nuts, and give away your money. Making the correct fold with a strong hand like AA (or TPTK) is one of the hardest things to learn and it literally took me years. But once you understand how basic and robot-like most people play at these limits, you will realize that in certain spots when they are showing aggression, their hand is literally face-up. Turn and river raises are almost always two such instances of that. You can simply filter in your database for all the times where you got raised on these streets and you continued in the hand. You will see just how much money you are losing. For me it took getting stacked probably 100's of times before I decided to change this bad habit of mine. Who likes folding aces after all? Exactly nobody. But once you realize that there are certain situations like this where you are clearly behind, you can decide to change. Of course many don't change and that is the difference between winners and losers. This was and still is to a certain degree a huge issue for me and many Nits. We fear moving up and require way too many buyins before we take a shot at the next higher stake. In some ways this is a good thing. I for instance have never gone broke (as in having 0$ in all my poker accounts) in 10 years of playing online poker. Dan Colman (mentioned before) on the other hand has gone broke countless times by his own admission. However, he has made 10 million+ dollars playing this game and I definitely have not. So there has to be some in between here. I already wrote a guide on bankroll management for the micros. In that article I suggest that 30 or 40 buyins should be enough for most people at these limits. If you find yourself with 50 or 100 buyins for the next level, then it is time to stop being such a Nit. You are definitely holding yourself back by being too conservative in your bankroll management strategy. The facts are that all of the real money in this game is made at mid and high stakes. I only talk about the micros on this blog and in my books and videos etc. But my intention is to help get you out of the micros. That really should be your goal in this game if making a lot of money is a priority for you. So this means that you will need to take shots more often at higher stakes games. And with this of course will come failure. Moving up is never easy and everybody fails at some point (sometimes multiple times) before sticking at the new limit. But unless you want to trade nickels at NL5 for the rest of your life, it is necessary that you break out of your Super Nit shell and take shots at the next limit a little more often. You never know, you might just succeed! In fact if you are already winning at your current limit then I can all but guarantee that you will win at the higher one as well, in the long run. This bad habit once again applies to both Nits and LAGs. It doesn't matter how good you are at this game, you will have days where your AA gets "cracked" 6 times. You will have days where every flush runs into a higher one, heck you can't even win with a full house! And sometimes these days will turn into weeks of this same sh crap over and over and over again. This will be enough to drive anyone crazy. Poker is a highly emotional game and when combined with the speed at which online poker is dealt, the results can be disastrous for some if things are not going their way. I tilted like crazy early on in my poker career. I made all the classic mistakes of turning into a LAG, rage typing, jumping stakes and playing ridiculously long sessions when I was in nowhere near my best state of mind. I threw away countless buyins (money) through both minor and major forms of tilt for years. The problem though is that if you ever want to make it in this game, you obviously can't do this. I had to make some changes in a big way and that is exactly what I did. Number one, I actually just stepped away from the game (at least on a full time basis) for a year. When you have a "real job" the ups and downs don't affect you as much because you don't rely on poker to pay the rent. Secondly, I started really focusing on the long run. Even through all of my crazy tilt sessions I was still somehow a big winner over my entire poker career up until that point. I put my career graph as my desktop wallpaper and any time things started going badly I would sit out for a bit, take a few deep breaths and look at that graph (reality). Lastly, once I finally got it through my thick skull (after years) that the long run is the only thing that matters in this game, I just stopped looking at my results altogether, at least on a daily basis. Sometimes to this day, I go weeks without looking at my results. Why? Because they don't matter. I am always properly bankrolled and playing in games that I know I can beat. So why should I get all upset that I happened to lose 5 buyins today. Or get a false sense of happiness because I happened to win 5 buyins? I know that I will win in the end. I don't care about the details of how I got there. Monkey tilt has been the death of so many promising poker careers. You need to take the steps that will help you be more relaxed at the poker tables and focus on the only thing that matters, the long run. This means focusing on the only thing that you actually can control in this crazy game which is making the best poker decision in each hand. The results will take care of themselves. This last one applies to both LAGs and Nits as well. It took me a long time to accept the fact that I had to table select if I wanted to win big even at the very lowest stakes. I started playing in an era where I could load up 24 random tables at NL25 on PokerStars and expect there to be at least one huge fish on every one of them. This is just nowhere near the case today even at much lower stakes. About 5 years ago I made the conscious effort to start dramatically reducing the number of tables that I play at in an effort to spend way more time focusing on who is actually sitting at my tables. My ego held me back for years in this regard and I think this is the case with many others still today. I had to accept the fact that I am simply not going to "crush" a table full of regs even at very low stakes. They simply do not make enough fundamental mistakes in order for this to happen. If you want to win big at the micros (or at any stakes for that matter) then you need to get off the Zoom tables and start hunting the bad poker players. Learn how to play short handed as they often hang out on these tables. And site select and play as many formats as you can as well. A commitment to always playing with bad poker players is the only way to "crush" today's games no matter what limit you are playing. Everybody has bad habits at the poker tables, even world class pros. The real key to moving forward in this game is constantly trying to recognize them and fix them. The reason why so many people fail to achieve their goals and dreams in this game is because they keep making the same mistakes over and over again for years on end. Nearly all of my biggest breakthrough moments in poker have come when I consciously made the decision to stop being such a stubborn idiot and do something differently. Ego is a very real thing in poker. Much like driving a vehicle, everybody thinks they are good at this game. But when 3 out of 4 people lose at poker in the long run, this is obviously not the case. Don't allow bad habits to stop you from achieving the goals that you have in this game. Always remain flexible to the idea that there might be a better way to do something. The best poker players in the world are chameleons. They know how to adapt under any circumstances. They don't cling to beliefs that there is only one right way to play a hand or that they have everything figured out in this game. Because none of us do. Poker is a lifelong journey that humbles us all at times. Take it all in stride, learn to pivot when necessary and you will have the most success. Make sure to pick up your copy of my free poker ebook in order to find out the strategies I used to create some of the highest winnings in online poker history. If you found this article helpful then do me a favor and "Like" or "Tweet" it below! Great post Nathan! Really enjoyed the final thoughts as it is motivating during the downswing I am facing.. Keep it like this! Yo! Hi Nathan, great post as usual. Could you please write an article on 3bet defense and 4betting for NL10 and higher limits? Would be awesome! PS: Sorry to post this here but I didn't know where else to post. Thanks! And I appreciate the topic idea. I will make a note of it. You might want to check out this mega article from last year on 3Bet pots. I did cover 3Bet defense and 4Betting in it. Nice post Nathan, the final thoughts part at then end added some great extra value to the article. Keep it up! Thanks as always for reading Jorge! Nathan, I received a strange e-mail from your dtb address, I want to make sure you weren't hacked. I replied, the details are there. Nothing strange about the email. Totally standard courtesy email to those who receive my newsletter but have not engaged with it in a long time. I explain more in my email reply. Such a labour you're doing. Great advices as usual Nathan. Nathan how many tables do you recomend to play in todays game? I usually play 9 tables at nl2 is it alright?